One of the biggest, most common, problems with solar thermal systems in the past has been incorrectly laid out collector arrays. In many cases, thermal expansion has caused pipe damage, and in others, excessive flow rates have caused erosion in the piping. Needless to say, a properly laid out collector array will bring the performance of the collectors up to (or even above) design conditions and still maintain the the physical integrity of the system. The image to the left shows a great standard layout for collectors with 1" headers – a typical 24 collectors in 3 rows of 8. The ball valves on the supply and return allow for the isolation of each row, and the lower header of each row has a pressure relief valve that can be used to relieve pressure and drain the row when needed. Automatic air vents allow trapped air to be purged as needed, and a thermal bleed valve that acts as a secondary freeze protection (in case the pumped recirculation fails) by allowing warmer mains water to flood through the row. 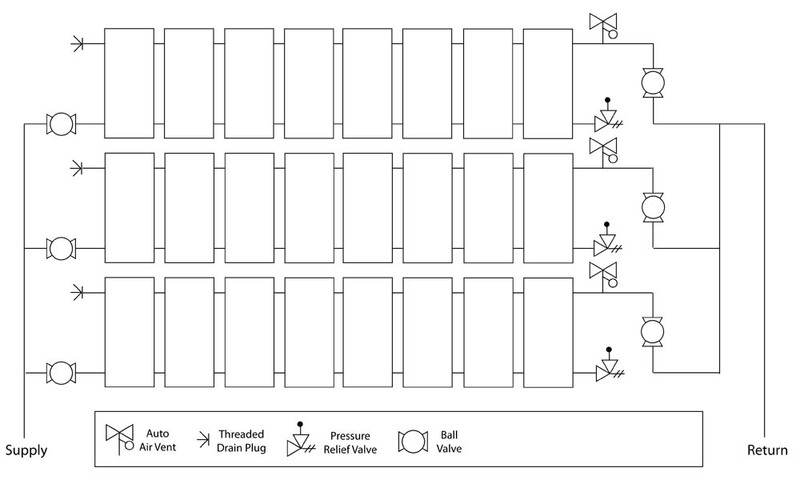 The only difference between the closed-loop glycol array and the open-loop array is that the thermal bleed valve has been eliminated. Additionally, the air vent in a closed-loop glycol system can be manual instead of automatic because there is only a finite amount of air in the system that can be manually removed after startup the system sealed. The drainback array, as you can see, is the simplest of all because it doesn’t need a thermal bleed valve or air vents. Plus, there is no need for isolation valves on the collector rows because the loop is unpressurized and the fluid can’t flow against gravity back up into the collectors. 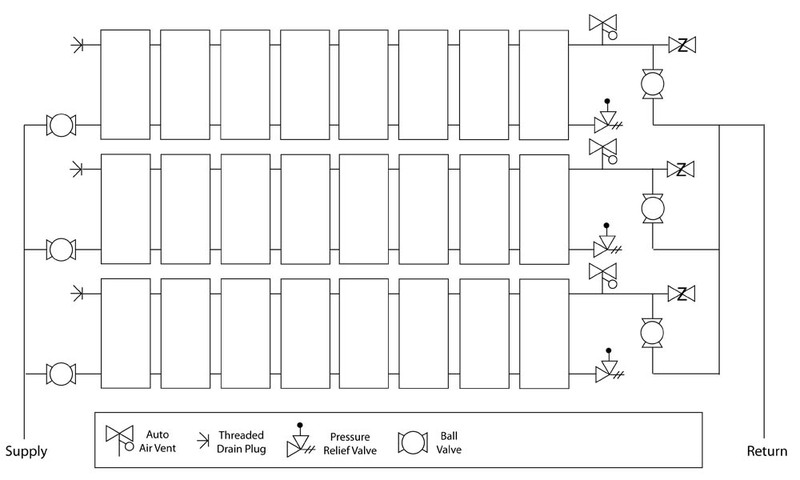 In fact, the only valves are the isolation valves at the inlet of each row. However, all piping in the drainback array must be sloped atleast 1/4" per foot so that the array can properly drain. All fittings and valves should be carefully located so that they do not restrict the ability of the array to drain under gravity. You should look to balance the flow between the rows of collectors in your commercial solar thermal arrays, but also balance the flow within each row of the array as well. This is important for a simple reason – studies have shown that collectors / rows with different flow rates generate as much as a 40F temperature difference. This temperature difference will create a significant decrease in output. These temperature differences are generally less in 8 collector rows, however, balancing should be attempted anyway. SunMaxx engineers recommend the following two methods for balancing the flow in your collector array rows. The first method for balancing your flow is with ball valves. This is very simple – you can partially close the ball valves to level out the pressures between the top and bottom headers. You can use an IR gun to measure the covertemperatures of the collectors and when the temperatures are balanced, the flows should be as well. The second recommended method for balancing flows is to use a parallel-series method (split your 8 collector row into two parallel sets of 4 collectors – just plumb through the first 4 collectors in parallel, send it through a downtube and then plumb it through the next 4 collectors in parallel. this will nearly eliminate any flow differences. However, it will double the flow rate through each collector which will cause increased pressure drop (though it should not be enough to be a problem). 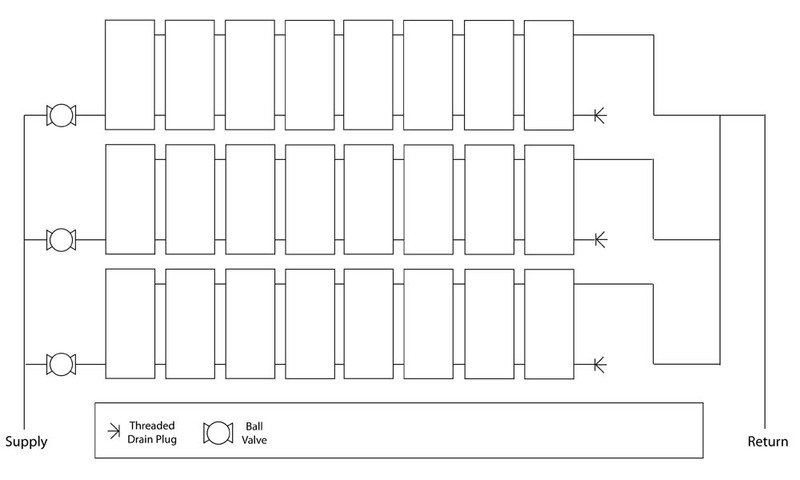 Note – this method can not be used with drainback systems, but is great for open-loop and closed-lopp glycol systems.